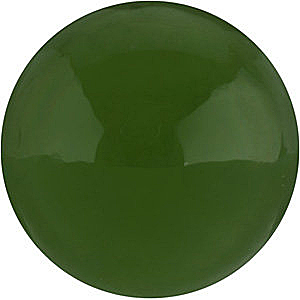 Round Jade in Grade AAA This Natural Jade Gemstone, Displays a Lush Medium to Medium Dark Apple Green Color, Has an Opaque Clarity, with a Good Cut, Good Polish and Low Dome. 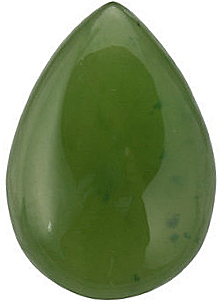 This Jade Gemstone Had Not Undergone Any Treatment. Imagine the still, calm green of lily pads poised gracefully on a lake. Picture the leaves of a stately oak tree rustling in the wind. These are the greens, natural and lush, embodied in Jade gemstones. For those who like to feel connected to nature and the earth wherever they are, Jade jewelry is the perfect reminder that we are all part of something bigger than ourselves. 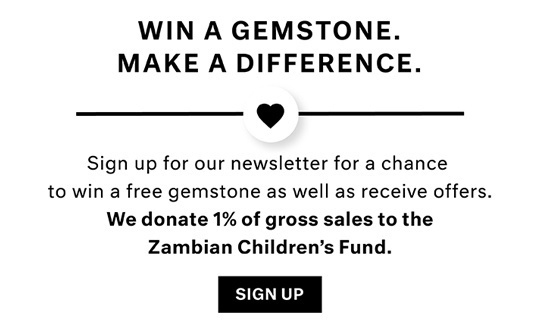 AfricaGems carries a wide array of loose Jade gemstones in calibrated sizes as well as gorgeous Jade rings, set in yellow gold to really accentuate the unique green tones. Ancient humans discovered the unique qualities of Jade more than 7000 years ago. Prized more for its toughness than its beauty, Jade was used in weapons and tools. It has a long history in the art culture of the Chinese empire. As early as 3000 B.S. Jade was considered a royal gem; its value comparable to gold and diamonds. Jade was also revered by the Mayan, Olmec and Toltec cultures of South America, as well as Ancient Egyptians. The Egyptians considered Jade a gemstone that represented love, harmony and balance. Today, Jade is symbolic of goodness and beauty, representing the virtues of wisdom, compassion and courage. The ancient and modern unite in this natural-colored gem. 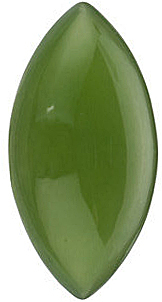 Nephrite Jade ranges in color from dark sage to deep leafy green. Its moss-green hue brings an organic feel to jewelry designs. While many consider it to be a soft gem � Jade is a 6 to 6.5 in the Moh�s scale of hardness � it is a tough gem, meaning it is extremely resistant to cleaving or breaking. 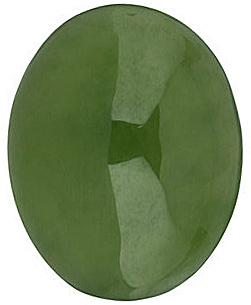 For this reason, Jade is typically carved or cut into cabochon shapes.